This is me at home in my sewing room aka. the dining room. There’s a huge Japanese pattern sheet spread out on the table behind me. In the background you’ll see a huge blackboard leaning on the wall. I’ll post some photos of it soon, it has a ‘special feature’ that I’m quite proud of. Above the dining room table is a cherry wood veneer lampshade that I made. It’s lined with a beautiful pink & gold paper from The Paper Place. Dear friends, have I told you recently how much I like you? I love that you visit me and see the things I’m doing. It’s fun to tell you about the things I’m learning, the mistakes I’m making and the ideas I have. Today I’m in the mood to hear from you and I’m ready to tempt you to speak up. I’d like to give away one of the lovely snap coin purses I made over the holidays to a lucky commenter to this post. All you need to do is leave a comment telling me one important thing that you learned last year that has really stuck with you. It could be something little, something crafty, something funny or something scientific! This contest will be short, it’s really for the people who are here everyday (so flattering) – you have until midnight tonight – Friday January 9th. I’ll draw a number over the weekend and announce the winner on Monday! One important crafty thing that I learned this year was that Japanese craft books don’t include seam allowance! I will never ever forget that. I learnt something really practical: when doing an SSK decrese, purl (or knit) through the back loops on the next row and it’ll make your decrease lie flatter! What a lovely photo (I love your lampshade sooooo much) and what a sweet post! One thing I learned in 2008 is how to make a quilt! I would never have thought it possible before. Yay 2008. I’ve learned that red squirrels are the most annoying creatures on earth, at last when they get into your house. They are too persistent and very challenging to remove. Sorry for the whiny tone but they’re rumbling above and driving me nuts (no pun intended). I’ve been admiring your snap purses – they’re so cute, and I’d love to win one! I’m going to have to say the same as Anabela – last year I learned how to sew and how to quilt. I never would have predicted that, nor how much I enjoy it! I also learned that the final measurements of your quilt are not really final until after you wash it – it really does shrink more than you’d expect! I love the snap purses and I really hope that The Workroom has more workshops on them because I’m moving back to Toronto in the Spring and I really want to learn how to make them! This past year I’ve learned that I do better – thrive even – in a creative environment. So I need make sure I’m in said environment, even if it means creating it all by myself. btw – your blog and The Workroom makes me even more excited about moving back to Canada! I had a baby last May so I learn new things daily if not by the hour. My latest most useful thing I have learned that if I put on “Max and Ruby” at 8:00 I have about 10 minutes to get dressed and ready to leave the house, which is an improvement from before. Craft and Art wise, one day of daycare is what I needed to be artistic again. There is so much thing that I have learnt last year that it makes it difficult to chosse. 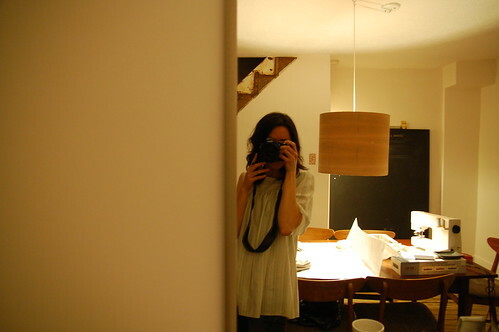 But the main thing would be this : I leraned to be at peace with myself.At least….her I come 2009 !! Karyn, I loved your post this morning. It’s nice to read about what other creative people are working on and thinking about. (And nice to see that others use their dining room tables at home too!). In the last year I’ve learned to sew (again, and on a machine! Properly! ), and I’ve gotten to see more of a creative community in the city, (largely thanks in part to the workroom!). I’ve also learned how to cook a lot better. That’s something I’m really proud of. I’ve learned a lot over this past year because I’m finally back into sewing almost everyday. Probably the biggest thing I’ve learned is that throughout any project you have to be as accurate as possible at every step. The more time I spend making sure my fabric is perfectly lined up, making sure my cutting is just right, taking a little extra time especially at the beginning of a project–the better my final product looks! This is so lovely Karyn! Much of my “crafty” learning has come straight from the Workroom – so thank you for that. I have learned that a nicely wound bobbin is the start to all great sewing projects and that taking my time will always pay off in the end! And…that hemming pants is wildly easy and I have been paying way too much for this when I could have been doing it myself. I hope 2009 will bring on the knowledge of how to make clothing and sew something from my own pattern and design! what a sweet post! And it is so cool to get a little peak into your dining room! I learned how to silkscreen in 2008,….and still learning!! One thing, just one thing I learned in 2008?!?! Wow that’s tough. If I had to really pin it down to one thing that I learned in 2008 it would be that tying threads together is temporary but a backstitch is forever. 1) Good coffee mugs are as hard to find as wide shoes for women and unicorns. 2) If my gut tells me something, I need to pay attention. 3) If someone inspires you, tell them. 4) You should not confuse your career with your life. 5) Nobody cares if you can’t dance well. Just get up and dance. 6) A person who is nice to you, but rude to the waiter, is not a nice person. 7) Your friends love you anyway. Reading your posts is a great way to remind me of the joys of crafting in the midst of a heavy work day – it’s like a nice big deep breath. So, thank you for sharing! I learned in 2008 how important sewing was for my soul. I discovered sewing projects can produce such a feeling of accomplishment and satisfaction while also being very relaxing and meditative. I draw on these feelings when I face the daunting tasks of thesis writing. I learned that sewing and crafting is really important to me this year. It just came back into my life last year and I now have a permanent sewing space in my house. Nora’s post has me all tear-eyed. Such wonderful things to learn/remember! I learned how to sew in 2008. I keep a running list of things to do before I die, and since I’ve recently realized I have no idea when that’ll be, I’ve been burning through the list with a little more intention. I always knew that textile arts in general held something deeply satisfying and creatively fullfiling for me, but never had the time/money to do much more than collect fabric and patterns obsessively, annoying all who share space with me. Learning to sew and sewing (dresses! quilts! a million little zippered pouches! leg warmers! neck ties! sketchbooks! ee!) has been an empowering, freeing, exciting, neck-straining (ooh, karyn how about a yoga for sewists class!joint with the place-across-the-street? )learning-about-self experience. hopefully in 2009 i’ll learn about how to keep those fires burning. karyn, you and your workroom have hugely inspired me. Thank you! What I learned last year is very simple, very naif, but tremendously powerfull. I learned to sew!!! and, because of that, I learned that the ‘craft people’ that we look up to, read and learn from, are willing to help a perfect stranger that sends Emails requesting for help, out of no-where. These are human values that makes us believe that, sometimes, people really want to simply help, with no other intentions but to give, free of second thoughts. -That The Workroom is one of my favourite places in Toronto and one of the places I will miss the most. -That putting darts in clothing is not as difficult as it seems. Because you can always unpick. -That you should wash the dress you made to wear on New Years Eve BEFORE New Years Eve ‘cos when you sweat the chalk markings might run and then you’ll have weird blue half rings under your arms. -That while Amy Butler patterns fit me from the waist down the waist up will always be a disaster (this is where the dart thing comes in). -And (maybe the most important thing, definitely the most awesome thing) that sometimes when someone is doing the dishes and you ask them to move to the other side of the world with you, they will say yes. I think the most important thing I have learned in 2008 is to love and take care of yourself. In order to love the people around you, you have to love yourself first. In order to take care of the loved ones in your life, you have to take care of yourself first. On a crafty note, I have learned to just do. The pattern looks too confusing? Just do it and it’ll usually work itself out. Working on a giant project that you don’t think you’ll ever finish? Just do a little everyday and don’t think about finishing it, and soon you’ll be surprised how close you are to actually finish it. Last year I finally learned that being a grown-up is cool. &Today I learned I want to see more photos of your pad! I learned to just try things; crafty, knitting, cooking or otherwise. If it doesn’t workout, try again. I never wanted to start anything for fear of failure and I think I am finally getting over that! I’ve recently discovered your blog but it’s quickly become a favourite. I have to say that my big learn was to trust myself and to be fearless. I have to work on that every day but I’m always pleased by the results. I started a new job last year and I discovered I’m not happy in my career of 20 years. Last Tuesday I started to change that by enrolling in school. Not easy–since I’m on my own and have bills to pay. But the alternative (stagnation) isn’t acceptable. wow… in 2008 I learned to paper piece! thanks to the workroom. it’s kind of cheating because I learned in 2007 the very basic crochet stitches, but this was in the last week of December 2007. I really learned to crochet in 2008, and boy, it’s taken over my life! I, like many others who’ve posted above, find it meditative and relaxing, and love the feeling of accomplishment I get from completing something and giving it away. I learned that it really is therapeutic for me to make things with my hands — neurologists have verified this! — and I should stop feeling guilty about my knitting and sewing time. I’m very impressed with your lamp! I learned that I don’t have room for hate in my heart. I tried it, and it didn’t work. I wish my little sister’s heart had the same tendencies. Oh well. Fun: The best date night is one at home with a good bottle of wine. I learned to deal with rejection from shows. I allowed myself 15 minutes of self-pity and pouting, and that’s the end of it. Move on to the next goal. Fifteen minutes, no more! p.s. I love the lampshade! love your space by the way. In addition to the things I learned at the Workroom (zippers!) I learned that you don’t have to have sewn your whole life to sew things well. I was worried when I started sewing (in 2007) that the things I made would look too “homemade” for my taste, but when I pay attention and go at the right pace things turn out beautifully. I’ve also learned that flaws really do fade after a few days, and no one notices the imperfections in the things you give as gifts. Finally, I’ve learned to always check the basics when things are going wrong–improperly loaded bobbin anyone? This year I learned about the world of blogs and how to have one of my own. I also re-learned how to knit. My first toque is almost done! Eee! I learned that if I am nice to my husband, he will let me go places by myself (we have 3 boys) and will not complain when I buy more fabric. I love your sewing space… and I can’t wait to see what is special about your black board! i have learned so many things this year, i hope you don’t mind that i list some of them! 2. “pin where you will cut” – this is something i learned from joana when i took the doll class at the workroom. i was sticking pins all over the pattern! now when i lay out my pattern on the fabric, i have a nice little outline of pins. 3. iron when it says to iron. 4. where there is love, there should be hope. 5. some things are just not worth getting mad about. 6. a smile goes a long way. 7. grilled cheese sandwiches with a bit of pesto is good with hot chocolate. 8. your family is the best friend you’ll ever have. The most important thing I’ve learned is to let go. I started spinning 2 years ago and in 2008 I just didn’t have time anymore. So I decided to sell my spinning wheel and to concentrate on the other things in my life, knitting and sewing. Sometimes, you just have to decide to let something or other go, even if it is something you enjoy immensely. I’ve come to appreciate not staring at my spinning wheel and feeling bad that I’m not using it! A couple of years ago I learned to Trust the Pattern — just start doing what it says and it will all become clear. Well, this year I learned Trust Yourself Because Sometimes the Pattern is Crap! I am learning that I would really like to try something from one of the Japanese Craft Books. I just have to get the courage to work without instructions. I learned to make a skirt, and then I learned to make skirt patterns! Feel the power? Love your blog!! One thing I learned last year is it is wiser to keep my mouth shut and not always have the last word. i learned how to make freezer paper stencils – so easy! I learned that everything you make doesn’t have to be perfect, it just has to be made with a little love, and some thoughtfullness. thank you always for sharing! Something silly I learned in 2008 is that I can’t keep my bad brushing and flossing habits secret from my dentist! She can figure it out without me whispering a word. 2008 was so important to me because it was my first year as a married woman! I learned how to pull a home together… yes, that was the most important thing. one important thing i learned last year was to try out new things and ideas, even if i was worried what others thought or if it would turn out poorly. hey karyn, i like you too! I learned that we are all characters. Every last one of us. I learned that you are amazing and do amazing things and I hope to one day have 1/5th of your energy! I love your blog! It’s so inspiring to all crafty ladies (and gents). What I learned in 2008: I can live on less, give more, and be the happier for it. Karyn, your blog is always a source of creative wonder and fun for me. Thank you! One important things I learned last year (after so many years of resistance) is to embrace and appreciate your roots and where you come from. I also learned how great it is to be part of a community, even if it’s only a little bit (Hamilton’s a long drive away sometimes). Nora and Lynn both said it. I learned to just do it…not in the aggressive Nike way, but to stop wishing I were better at things and just start doing things and learning to celebrate the flops as much as the triumphs. I’ve felt such a tremendous sense of accomplishment this past year because I kept putting myself out there and trying new things. It is people like you, sharing the tips and the trip-ups of your own journey, that inspired me to keep going! Things I’ve learned in 2008, I wish I made a list. I learned how to make a felted join when knitting and that living with a boyfriend means you need to go get yourself some hobbies because after the third or fourth hour of listening to machine-gun video game noises, he becomes just a little less charming. So thank you Karyn for having interesting classes available to me for Jan, Feb and March. When’s Apr, May, June due out? Hello! I’ve learned that God will never give you more than you can handle. So when you feel you have way too much, just take a deep breath…smile…and keep sewing! I learned how to quilt this last year and its been a lot of fun! I’ve also learned how to knit lacy patterns. Thank you for your inspirational blog!!! I hope to make my first dress this year after following your dress adventure. Thanks for this give-away opportunity. We lived in Asia (Brunei) for a year in 2005 and I’m sure I saw Japanese dress sewing books in Singapore at the time but thought “IMPOSSIBLE! Don’t even look, you’ll just be disappointed because you can’t make that stuff since it’s in Japanese!”. Thanks to crafty blogs like yours, I ordered some books and made my first top and CAN’T wait to make more dresses, skirts, blouses…! Who knew? I learned how to make shirred sundresses! Hmmm. . .so may important things learned this past year. I guess the thing that resonates is most with me is that I forced myself to step back and learn to enjoy processes, instead of just blindly working towards an end result. It has totally changed my perspective, improved my observation skills & really helped me to appreciate the small and simple pleasures in life. So yeah. . .learning to enjoy process was big for me. Karen, I always look forward to reading your blog. It’s become a welcome break in my day and I really miss it on the days you don’t post! And you’ve inspired me to finally start a blog — one of my new year’s resolutions. It’s still on the “to do” list, and I’m still a bit intimidated by it all. But something I did learn last year that was on the 2008 “to do” list was that I really can sew. I’d never have believed I could put in a zipper or make anything beyond the bean-bag frogs I made by the dozen when I was 12. And the best part is that I have an 11-yr-old who wants to sew with me too! your lampshade looks wonderful. a few years ago, i used to make small lamps using paper from the paper place as housewarming gifts. i’d forgotten all about them until i read your post. the one thing i really had to force myself to learn (or accept) in ’08 is that it’s OK to make mistakes in knitting. often, you won’t notice them or you’ll forget about them and it’ll save you from the grief of frogging the item and re-knitting it again (and again). I learned that you can spin yarn with anything. I really wanted to learn but didn’t want to spend a lot of money. I took a wooden craft wheel, a lonely knitting needle and a rubberband to make a temporary spindle. And it worked surprisingly well. The experience helped me decide that it was a skill I wanted to persue. I think my favourite thing I learned last year was how to knit. This is defiantly something that will be staying with me forever, I’ve found it so fun and interesting and challenging all at once. What a great idea! I learned to be patient with myself… that any progress on a project (even if it was just one row of knitting after I got my toddler to bed and before the baby wakes up to nurse) is a good thing, and to allow my crazy hectic life to unfold just as it should. Thanks for sharing… your coin purses are adorable! I might add learning how to use those metal frames to my own crafty list of things to do for 2009! I learned that sometimes fabric that looks red on the computer screen is orange in person, and that it’s possible to change directions mid-quilt and still end up with something I’d happily put on a bed. Sometimes, so-called “mistakes” can present great learning opportunities – I taught myself to machine-quilt on that quilt because I wasn’t as attached to the end result as I would have been if I’d made the quilt I originally planned to make. I’ve learned how much joy you can get from simple things. A good cup of coffee during a leisurely morning, the feel of luxurious yarn, a pretty bunch of flowers – I’ve learned to recognize how these simple things offer me so much comfort and happiness. I’ve learned that creating something, even if I only get to work on it for 15 minutes each day, is essential for feeding my soul. Please, please post instructions on how you made the lamp shade. I love it and want to make something like it! oh i hope i’m not too late! i love that photo you have up there – can’t wait to see more. one thing i have learned.. is to be okay with things not coming out the first time, but to keep on learning and trying (and enjoying the process!) until i get it right. i love that lamp shade. and the huge blackboard. and your creations. shoot. i’m late. and then i don’T even follow the rules. something i learned last year. that has stuck. i learned how to make homemade binding tape. and love it. love it. love it. Those snap coin purses are adorable- when I saw them on your site, I made a mental note to myself to learn how to make one! Last year I learned how to sew in a zipper thanks to all the tutorials by generous bloggers. How nice of you to offer up one of your snap coin purses as a gift to one of your readers.